Poppy Juice: Do It Yourself Hair Color Weave or Highlights! 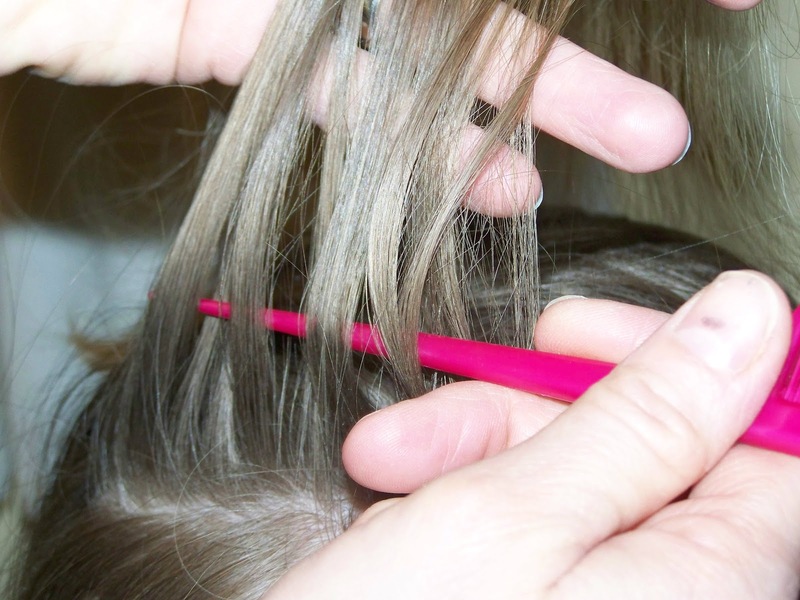 It is easier than you might think to do a color weave or highlights yourself (or for a friend). Salons charge between $50 to $100 on average for this service alone. Add the cost of a haircut and tip to the bill and you can expect to spend about $150 every 6 to 8 weeks! Save yourself a ton of money and control the results by doing it yourself. Be certain to take contact lenses out if you wear them. Put on clothing that you won't mind getting ruined. Even if you wear a cape to protect your clothing accidents do happen. Do not shampoo hair prior to weaving. If your hair has excess buildup, shampoo the night before. To prevent temporary staining of your skin around your hairline, you can apply Vaseline to create a barrier. If you are alternating color with lightener, you will want to create the lightener foils first as the bleach generally takes long to develop. For a bold, dramatic color weave look choose several different colors. A color several shades darker than your natural haircolor alternated with a bleach lightener creates a very dramatic look. For a very subtle look, choose a color that is just a shade lighter than your natural color. If your hair is anything other than a fairly light blonde, you will need to use a lightener/bleach kit to create light blonde highlights! 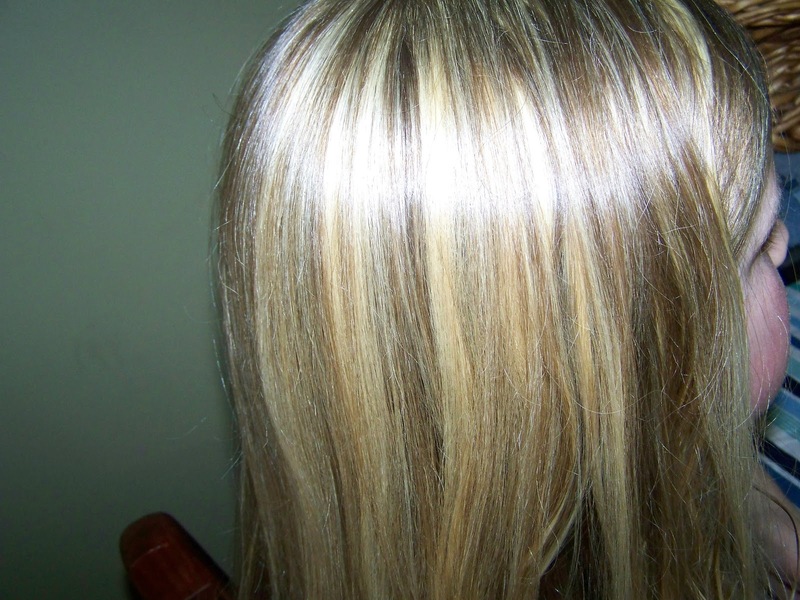 Hair that is very dark will go through many stages of lightening when using bleach. It will be orange in appearance, then pale lemon yellow prior to reaching the "platinum blonde" stage. For hair that is naturally very dark or has a lot of red in it, hair may not easily reach the platinum blonde stage. Weave larger chunks of hair for a bold look. 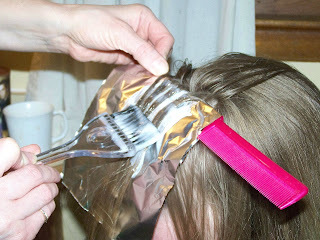 For less highlights/color weave, only place foils in a row on top of the head from forehead to top of crown. 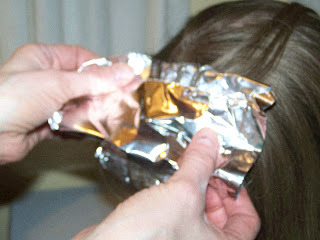 For more overall highlights/color, also place foils on the sides of the head and farther down the back of the head. squeeze bottle. Use 1 bowl per each color used. to "weave" hair, as shown in this photo. 5) With a paint style brush, apply to the strands. then fold up in half again. To prevent the foils from falling out, I crimp the foil to secure. and two on each side. directions and/or the time test. directions for removing product from hair. 8) Side view of finished highlights. 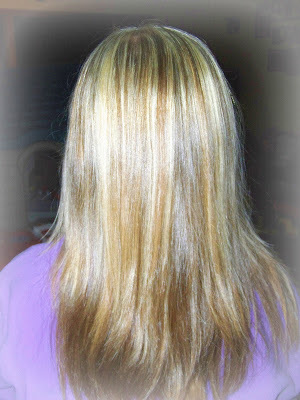 Back view of finished highlights. If you liked this article, don't forget to subscribe! ideas from Poppy's Money Tree House! I would say that it is easier to do on someone else for obvious reasons but I suppose one could have a friend do her hair then reciprocate the favor! Thanks for the positive feedback! I really appreciate your visit! I've been highlighting my hair since I was 16! I use the cap and pull through a few strands here and there. For lowlights I use the cap to, just with hair color. And, I actually had people stop me on Michigan Ave. to ask me where I got my hair done!!!!! I had to admit-my apartment, with a kit from the drugstore!!!! You're right-huge savings! Thanks for your visit! Yes, it is a huge money savings! I've used the cap as well but the longer my hair has gotten, the harder it is for me to do without tangling up. Great method though! It's nice to hear of other folks saving money while looking beautiful! 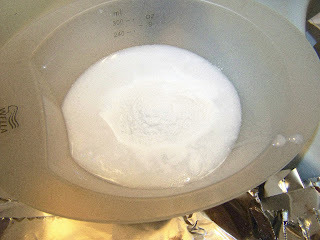 try sprinkling some corn starch on your hair before putting the cap on. It won't affect the color/bleach processing. Also remember to always work from the crown downand around. I'm pretty certain this posting wasn't aimed at myself. ;) Oh well. I'll wait for the next! Well now you never know when you might be able to help a friend out! It could be a handy skill to have! Thanks Ruth! I'll bet your hair is beautiful! As always, your visits are appreciated! Thanks Heather! I wish we lived closer because I'd help you! No, I haven't done a tutorial for all over color but I would be glad to put that in the works for you! I'll bet you could even correct the missed spots yourself, Heather. All over color (if it is not bleaching that you are doing) is much simpler. 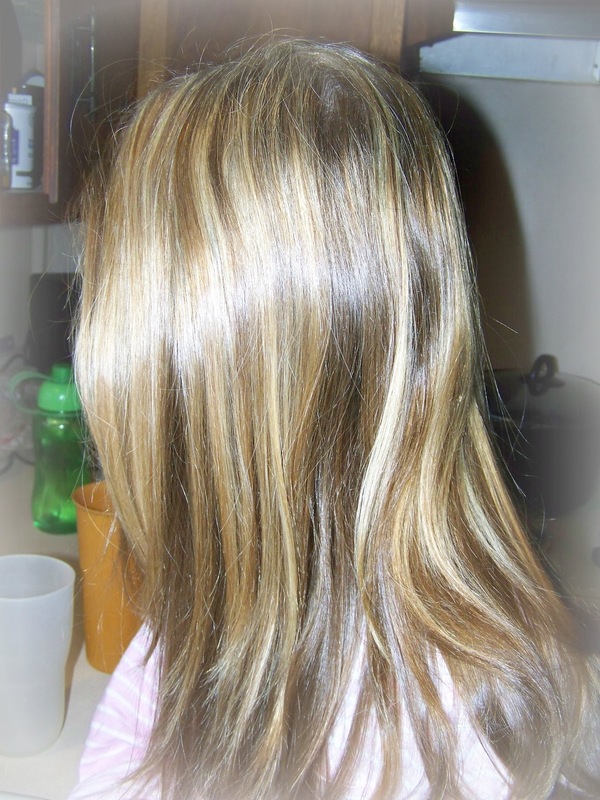 Are you trying to go lighter or darker than your natural color? Thanks as always for your visit! Have a wonderful night! 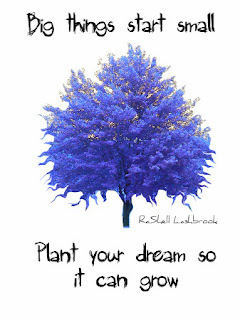 It sounds like you have a pretty good understanding of what you need to do! I'd love to see the black cherry color! Sounds gorgeous! Thank you for the positive feedback! If some of these ideas help someone else save money and live well then I'll feel like I've accomplished something! I'd be happy to help you accomplish it on yourself. Thanks Lola! I might have to take you up on that sometime! Hello! I love this hair color! I have very short hair that is brown with 50% gray. Any suggestions on if and how I can get these same results? Thanks! Do you need the rat tail comb in order to weave? I have used a chopstick and a pencil too. I think any object with a somewhat small pointy tip would work! Let us know how this turns out for you. I am going to try this!The reason why I want to use foil is because if you put the cap on, your really not sure what strands your pulling out. I am using Frost and Tip. Could I use saran wrap? 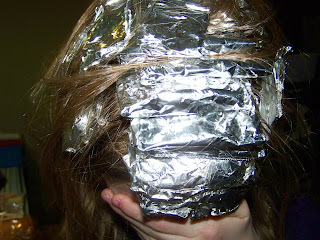 (just so I can see the results without unwrapping) or would tin foil work better. I can't find any reason that you shouldn't use plastic wrap. It would be helpful for you to be able to see the color changing. However, you might need to use a clip for each wrap to prevent the wrap from sliding down. Also, for me the foil wrapped rat tail comb helps act as a guide for brushing on the color or bleach. But I'll bet you can make it work. We'd love to know how using saran wrap worked for you! Thanks so much for the good idea! My question is, what happens the next few times you weave it. It would be impossible to collect the same strands of hair for the same colors again, right? This is a dilemma for amateurs and pros alike I guess. My hairstylist friend says that she just tries to follow the previously lightened pattern to decide what to weave in and what to "weave out" ;) I do the same thing. The rat tail comb and foil seem to really help me follow the previously highlighted areas. I suppose like anything, a certain amount of artistry and care go a long way and can make the difference between beautiful and DISASTER!!! You could in time end up with more blond than you want. Did you use a toner? I have medium dark brown hair. Should length thick and curly. I bought 20v developer and bleach. 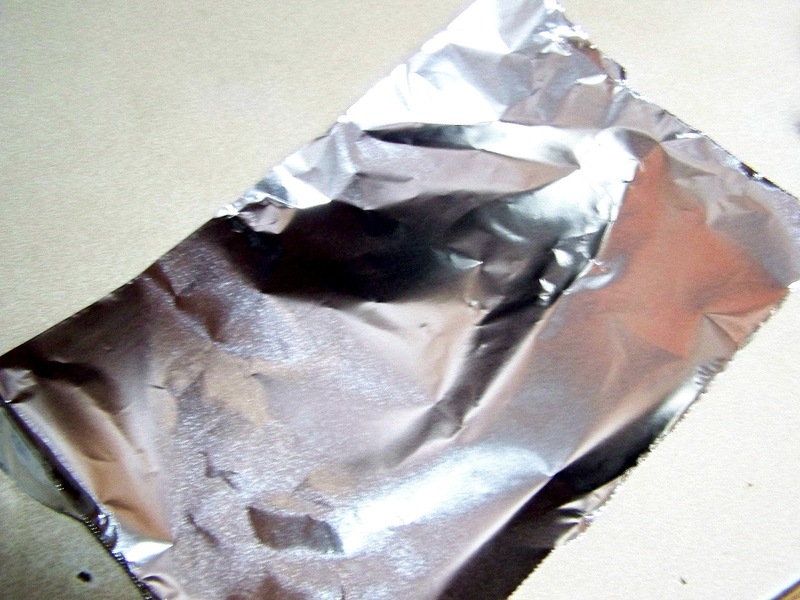 Have foil. Know about placement. I don't want white blonde ..... but don't want orange. Should I tone? I have medium to dark brown hair. Colored close to natural. To cover grey. I'm doing foils.... have 20v developer bleach foil. My question is do I need toner? I don't want white blonde.... don't want orange either. Help??? If you want something other than white blonde on the bleached parts you may have to double process by putting on toner afterward. I've always wanted some white blond in my hair (even with the grey that I have) so I've never tried to bleach then darken some. Are you wanting highlights or just multiple shades of medium to dark brown? If you don't want hightlights, just do the foils with alternating colors you desire (no need for bleach). This makes me want to look at beauty supply stores online and get some color to do this to my hair. It's perfect for summer and I'm so ready for a change. It is the perfect time of year for a change isn't it? Nice to know that you don't have to go broke doing it either! Have a great day! What brand did you use from Walmart? I've used several brands over the years. Garnier makes a hair bleach and so does L'oreal (Super Blonde Creme Lightening Kit). Both are available at my local Walmart for under $10 a box. I've found both to work equally well as long as I follow directions. I will be using this blog to do highlights on my hair. My friend will be helping me. I have been dying my hair for years, but have only highlighted my hair once. It turned out okay, but I am wanting to do different shades of high/low lights on my light brown hair. I am going for a summer look. Thanks for the excellent diagram. I looked into professional and it would cost 100$ to get the look I want, so doing it myself. Hi Poppy, thanks for this info.. I have brown and blonde all over highlights, but would like to go lighter. If I just use a medium-light blonde, will the hair still stay dimensional looking because of the colors I have in now?...I'm hoping so. Just do't want to do the whole cap thing again. I would think just adding a medium light blonde will be perfect to help you go lighter while still keeping dimension to your hair color. 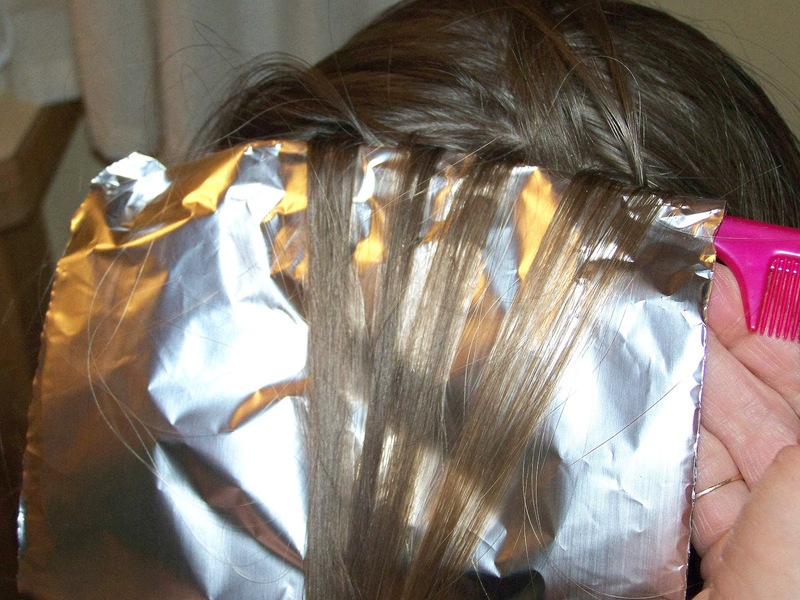 You can gradually go lighter by adding more foils each time. I agree, the cap is a pain! Wonderful! I'm so glad to hear that you're happy with the results! Send a picture if you like and I'll be glad to share with our readers! I think that weaving/foiling requires a touch of obsession & perfectionist attitude in most cases. Half-assing will not work! Hi, I know this is an old post. But I'm trying my luck :) My hair is dark asian hair. To get maximum lightening, I should do it slowly right? To do it myself, it would be easy for the first time. But for the next lightening sessions, I think it would be difficult to which strand that has been lifted before. What do you suggest to obtain more blended and natural result? Just do the weaving only on the visible part (most outer layer of my hair)? Hi there - Sorry for the delay! Somehow your comment ended up in a spam folder! I think that the most important think when doing follow-up sessions is that you don't lighten over the hair that has already been lightened. It isn't really that noticeable if the entire individual strand is lightened or not, unless you are doing big chunks. In that case, it's easy to tell which sections to lighten. But if you are doing a blended natural look, just leave the previously lightened ends out of the foil - taking great care to not put the lightener on them. You would still be able to lighten under layers, especially if you like to wear your hair up. Hope this helps. If you have doubts, consult a hairstylist. This is really fabulous idea poppy. Home made color is really cool idea but how it will stay ?